Sam of Becks and Posh was already here on opening day to experience the San Francisco incarnation of this Japanese cream puff phenomenon. While she experienced 30-minute waits, on Sunday afternoon when I dropped by, there were no crowds – the dividers were still there, but sitting unused off the side. We were able to stroll right inside and take a look around. I guess all the sweets freaks had already come and gone? 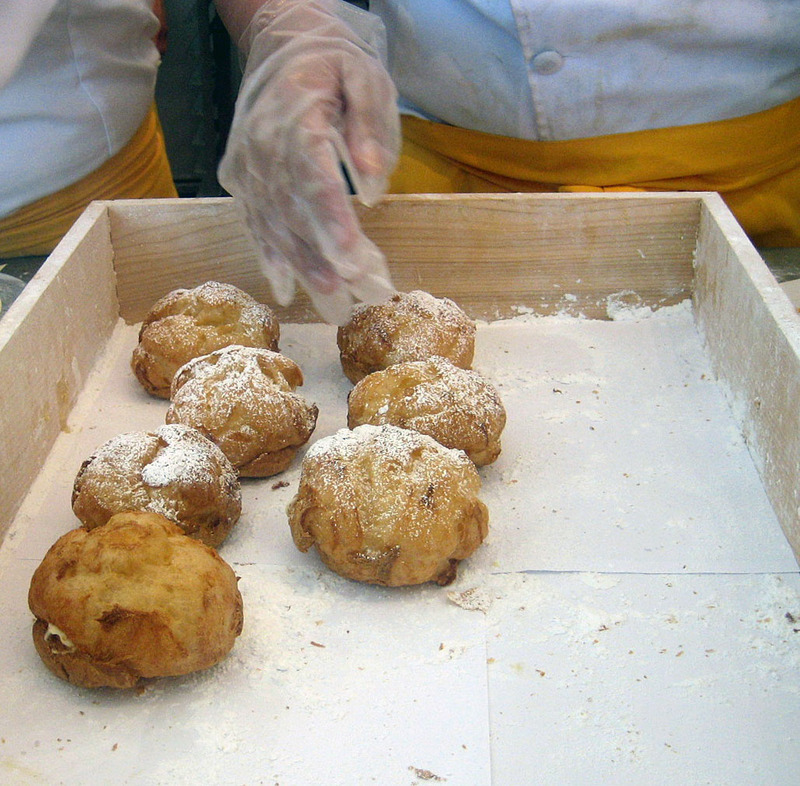 The menu board shows many planned items, including various flavors of filling for the cream puffs, but currently they only have the regular puffs with vanilla filling. 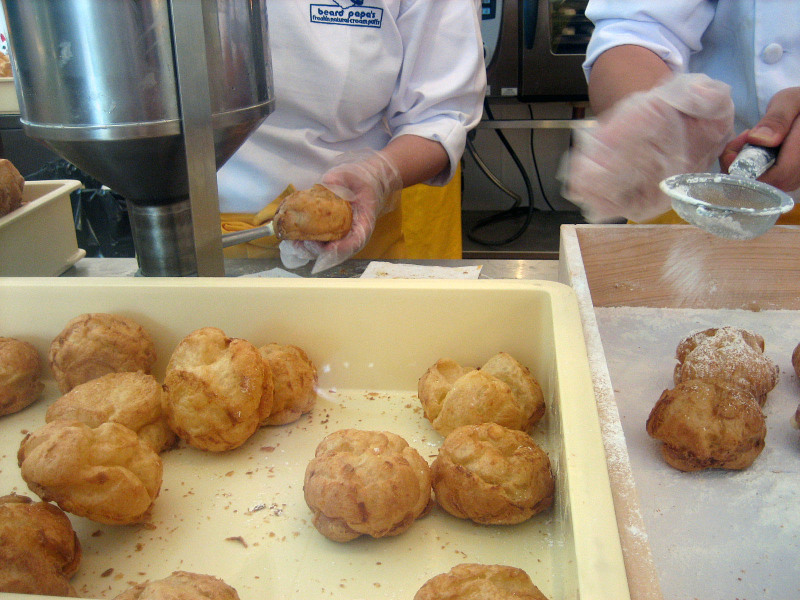 Beard Papa’s claim to fame is that they have a "two-layer" crust for their cream puff shells that prevent them from getting soggy, and that they fill their puffs to order for ultimate freshness. Everything happens right in front of you so you can see the puffs baking in the oven and the workers putting the creations together. Here’s the filling machine – what a handy device that is! – all you have to do is hold the puff up to the spout and it fills its up with the pastry cream. Next to the filling machine another lucky worker gets to sift powdered sugar over the puffs. In case you are wondering by now, yes, these are very large cream puffs. One of them easily fills the palm of my hand. One puff is $1.75, which is not too bad a deal. 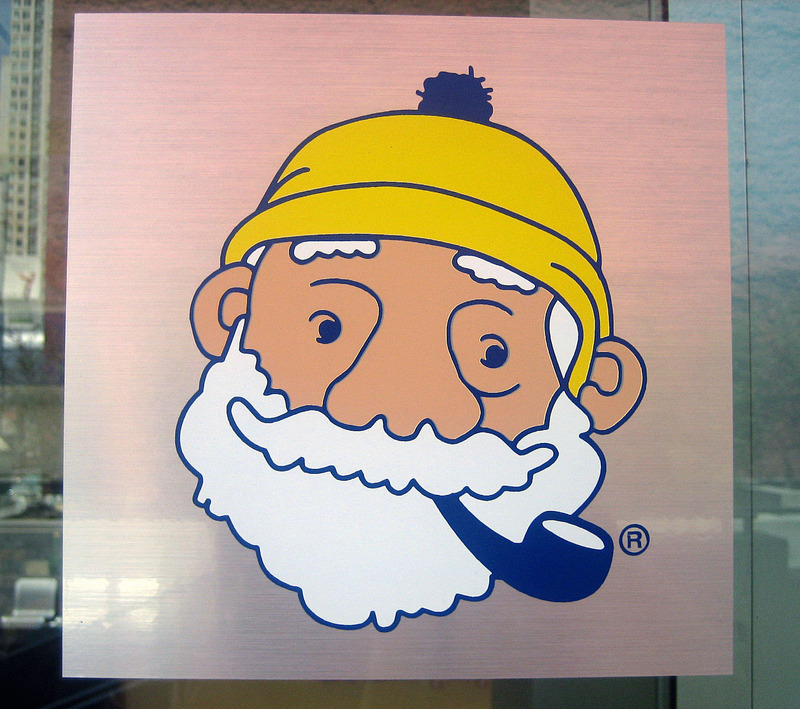 We took another look at the "Beard Papa" as we left the store. He really does look like the Gorton’s fisherman, doesn’t he? It was an absolutely gorgeous day in San Francisco, when you realize it’s completely sunny, not just sort-of-not-foggy, you’re actually hot, and you wonder, are you really in the city by the bay? We took our puffs across the street to Yerba Buena Gardens, where dozens of people were sunbathing, playing Frisbee, and enjoying this rare weather, and settled down on a bench to inspect our loot closely. First off, the puffs are large. I don’t know what possessed us to buy two of them – perhaps the hope that they would be as fabulous as their reputation promised and we wouldn’t be able to get enough of them? I took a bite. The shell is crispy and flaky, sweetened with the powdered sugar, and gives way to an alarming amount of filling (see top photo) that immediately had me calling for napkins. I would say this cream puff doesn’t fully live up to the hype, unfortunately. All of the components are fine, yet they don’t come together to the over-the-top whole I was hoping for. While yes, the shell stayed crisp and not soggy, it was rather plain and tasteless on its own. Perhaps also because Beard Papa says the outside layer is a piecrust instead of choux pastry, it didn’t really have the right "cream puff" texture to me. The pastry cream was creamy and inoffensive, with no distinct flavor. Perhaps some of the other flavors that Beard Papa is promising might be more interesting. Finally, the shells are nice and hollow – and they are completely filled with the pastry cream. It’s a lot of cream. I guess they are selling as a messy, indulgent experience – Americans love everything super-sized, right? but I really would have been more content with a smaller, more manageable puff. Having not visited any other Beard Papa Cafes, I don’t know whether they are still working out the operations here. I think I’ll make a return visit when they some other items to offer, but for now I’ll keep looking for the ultimate cream puff. I agree I think it is hyped too. It’s definittely not a dessert I will be dreaming about or rushing back to try again. It’s certainly no creme caramel from Zuni, not a thumbprint from boulette’s larder or a canelle from Bay bread. I thought the custard tasted like melted ice cream and i am not a big fan of melted ice cream myself. 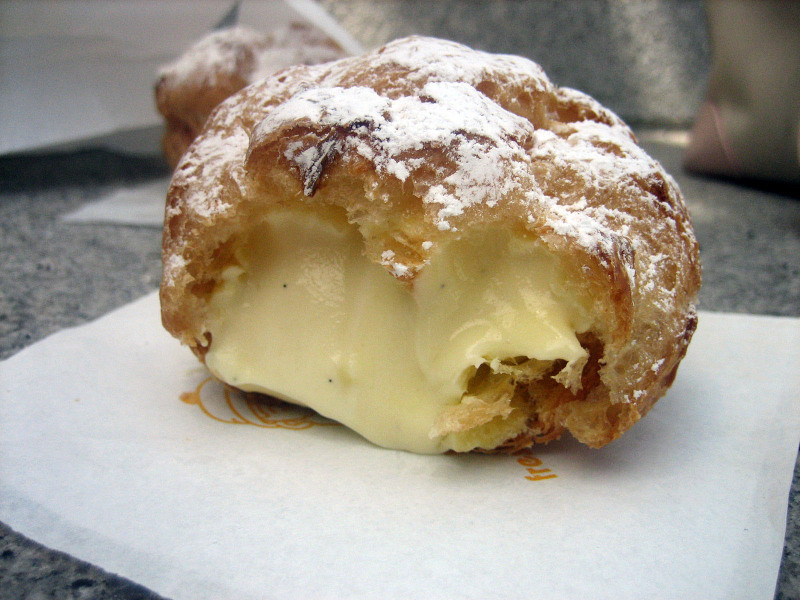 I recently tried Beard Papa’s cream puffs too when I was in NYC. I agree with you and Sam, I think the filling had a vanilla jello pudding taste. I tried a couple of other cream puff venues as well. I suggest that we all just make cream puffs instead. 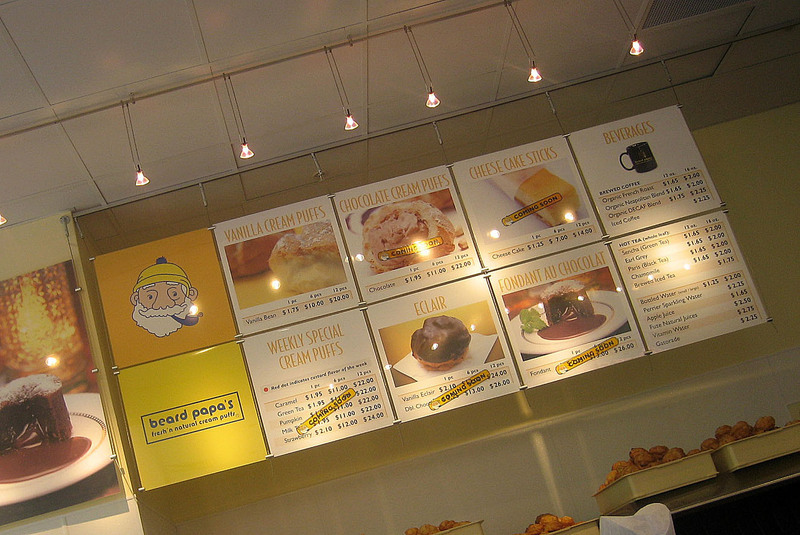 I missed Beard Papa’s in NYC – although if you think they’re the same then I guess I didn’t miss much! You’re right, I’ll stick to making my own fresh cream puffs! I guess I’ll have to try the original if I’m in Japan! I’m usually so amazed by Japanese pastry, maybe they’re doing something different over there to make it tastier! Beard Papa is quite popular here in Manila too, although I don’t think we have a cafe, just stalls. 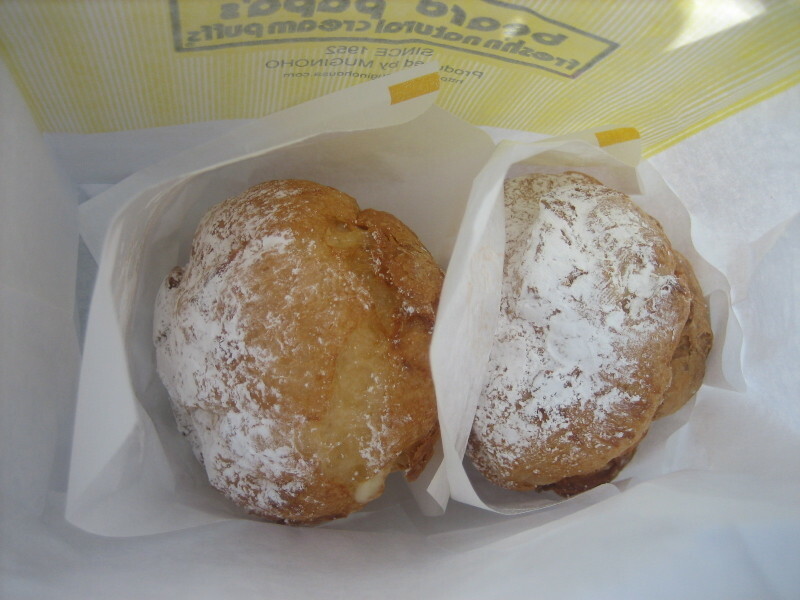 Although I don’t like cream puffs, I’d have to say that Beard Papa makes the only cream puffs that I like. It’s the large amount of filling and the pie crust-like taste that I like. But I may be in the minority. It was good, but not so good that I would line up to have it. I’ve had better– Delanghe Patisserie on Fillmore for example. I believe the crust is made out of choux with a pie crust layer on top of that; Martha Stewart’s most recent baking book has a cream puff recipe based on the same concept. 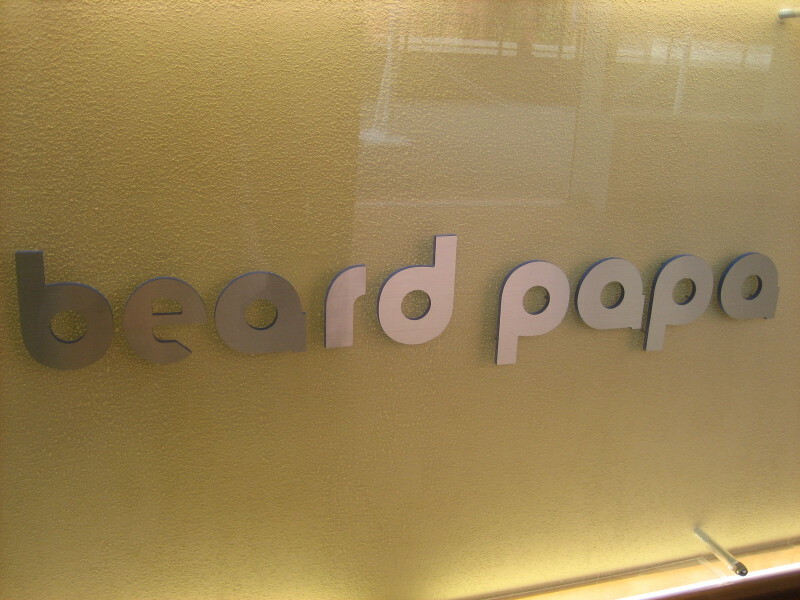 I think there are many fans of Beard Papa, not to worry! Different tastes for everyone! It’s good to know there are other sources of cream puffs in the city! Thanks for the note – I’ll check it out sometime! It has been a fantastic surprise walking in oxford Street in London last Saturday and discover this amazing Japanese cream puff! I totally agree with you! There’s a Beard Papa’s in NYC and while I totally enjoy munching on cream puffs, waiting even 20 minutes in line to pay $2 for a puff was a disappointment. The puff was good, but it wasn’t over the top amazing. But, regardless, I have yet to find another puff shop that comes even remotely as good to this one. In several shops in Italy, the cream was delicious, but the puff was bad. In Paris, it was the opposite; the puff was great, but not the cream. I’m in Sydney now and the puff as a whole is just incomparable. So I guess for now, Beard Papa’s still reigns.